SQUIRRELED is a fun math game for young children designed to help improve their division skills while having a little bit of fun at the same time. With tons of educational apps to choose from, it’s not always easy finding one that’s above average. But, SQUIRRELED definitely fits into this category. Squirrels have a reputation as cute little fury characters that everyone loves and this app only helps to reinforce these feelings. It strikes just the right balance between an educational tool and a fun game for kids – parents will probably enjoy playing along with their kids as well. This is a free app and it’s compatible with the iPhone, iPad, and iPod Touch. Educational apps should always aim to be fun as well. Kids tend to get bored easily if they’re not entertained and developers that are unable to recognize that fact are doomed to failure. Fortunately, the developers of SQUIRRELED did take this into consideration when developing their app. This app combines fun cartoon characters with cool music and sound effects and, of course, great learning tools. This is definitely a developer to keep an eye on for future fun educational apps. There are just a couple of minor issues with this app that do detract from it a little bit. The first is that unfortunately there aren’t any instructions on how the game is played. The only clue as to how it all works is found in the developers App Store description – it isn’t a difficult app to figure out, but a brief little outline of how the app works inside the app would be beneficial. The other issue is that the numbered acorns never change – a little bit of variety would only enhance the apps appeal. This app will require 71.1 Mb of available space on your iOS device. When you open the app you’ll see a pretty simple layout – you’re only options are to play the game, take a look at how you rate against others that have played the game in Game Center, or you can tap on options. In the options section you can change your character and you can also toggle the sound on or off. There are three different squirrels you can choose from and they’re all pretty cute. There’s no advantage of one character over another it’s simply a matter of preference. When you tap on the play game option you’ll go through an intro screen first. In this screen the three different squirrels you can choose from in the options section are playing and teasing each other in the trees. It’s cute the first time but after that you’ll probably want to skip right through to the game which you can do by tapping on the skip icon in the bottom left corner. On the next screen you’ll be directed to find acorns numbered 1, 2, 3, and 5. You can create these by cracking larger numbers that these numbers are divisors of. It’s definitely one that will keep your child thinking while they’re having fun. 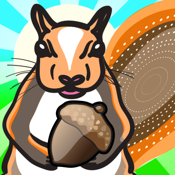 SQUIRRELED is a fun and interactive game that’s great for young kids. It’s a great way for them to work on their basic math skills and parents can have fun right along with them. This one’s definitely one of the more creative educational games for kids available in the App Store.